Though most of my blog posts here are recipes, occasionally, I like to share info on books and articles I’m reading, as well as personal experiences that go along with a whole foods lifestyle. ‘Diet and Exercise’ may not be the best title for this post. ‘Diets’ are seen by many as a short-term restrictive way of eating, something to help them get to a certain weight or goal and then they stop and go back to eating the way they did before (and not surprisingly, gain back the weight :)). Perhaps a better name for this post would be, “Good Food Choices and Exercise” or, “A Healthy Lifestyle”, since this post will be about healthy habits our family has established over the years, having to do with food and exercise. Our family is a bit different than your typical American family. We don’t eat at McDonalds, we don’t feed our children goldfish crackers, fruit snacks, or cereals and we really try to stay away from processed foods, which are usually the boxed and packaged goods. We don’t eat a lot of meat, and because we don’t eat it often, I’m totally okay with spending a little more on our meat so that I know it’s not coming from an animal that was pumped full of hormones and that it was raised humanely. We also don’t eat as much as your typical American, but rather have three meals, with usually one late afternoon snack. We didn’t always eat this way. I remember five years ago when we were eating at McDonalds, snacking on goldfish crackers, amongst many other processed snacks, all throughout the day, and Mac and Cheese and Dino Buddies (chicken nuggets) were frequently seen on the dinner table. We were also sick a lot more then, regulars in our doctors office, getting antibiotics and such. This never happens anymore! Now, the only time we see the doctor is for our annual wellness checks(and we’ve missed several of those, whoops! It’s hard to remember when you’re feeling so good! ), vaccines for the littles, and when we need a broken bone set :), which has happened twice in the past several years. Just like Hippocrates said, “Let food be thy medicine, and medicine be thy food.” Something else happened five years ago that changed our poor eating habits: my mom was diagnosed with 4th stage cancer. She had a tumor on her pancreas and cancer in her liver. She was told she didn’t have long. She didn’t do chemo, but instead made some significant changes to her diet and started to heal herself naturally. She’s still with us today and doing well. In the beginning, she would send me articles on food and how it directly related to our health. I couldn’t believe what I read and decided to experiment on our family. When our health turned around, and my baby weight came off naturally even after baby number 5, we kept going and never turned back. And so our whole food journey began. We’re also different from your typical American family in that we are not regular TV watchers and we don’t own any video game systems. When the kids get home from school, once they’ve finished homework and piano, we encourage them to go outside and play ball or ride bikes. After dinner, we have reading time. When we get a lot of snow, we still encourage them to be outdoors but instead we’ll do things like sledding or shoveling the walkways which are still very active. On Saturdays, once chores are done, we’ll usually play a sport together like soccer, baseball, kickball or flag football. Now, that’s not to say we never watch TV or movies, because we do, but usually it’s a show or two on the weekends, after everything is done. Also, our kids can earn 15 minutes of Kindle Fire or computer time at the end of each day, if they’ve stayed on top of all their chores/homework etc. When the kids were really young, we’d take our toddlers out back and pass the ball with them while the baby sat in her saucer, or bouncer, on the patio, watching us, still enjoying the outdoors. Scott and I exercise every day. We schedule it in so that it gets done. 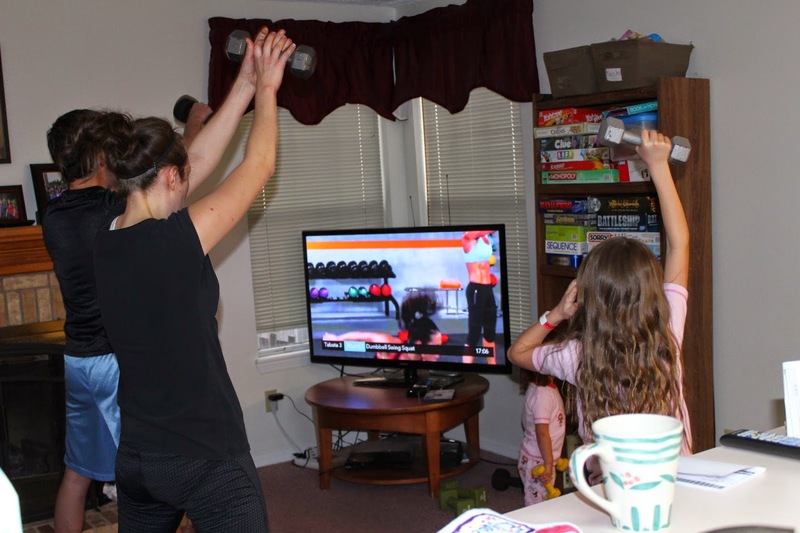 We mostly follow videos or worksheets so we can exercise in our home, and sometimes we’ll go for a jog. 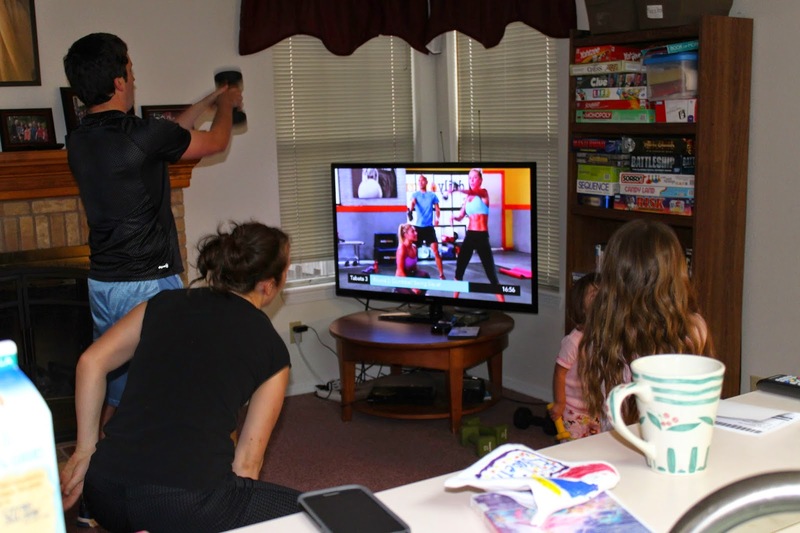 We like a lot of Bob Harper’s videos, he’s the personal trainer from Biggest Loser, and recently we’ve been doing a program called Inferno, on The Daily Burn, which is a channel we have on our Roku device (internet on TV). It’s a lot of weight and interval training, and a good amount of cardio. Exercising together has brought us even closer as a couple. When we exercise together, we’re encouraging one another, and we’re working toward a goal of good health together which not only blesses our lives now with increased strength and endurance to do all we need to do, but it will also bless our future, so that we can live long and happy, healthy lives together. As for food, we eat a lot of fresh, whole foods. Foods that have been around for hundreds of years before they started adding chemicals, dyes and preservatives, turning them into food-like substances. 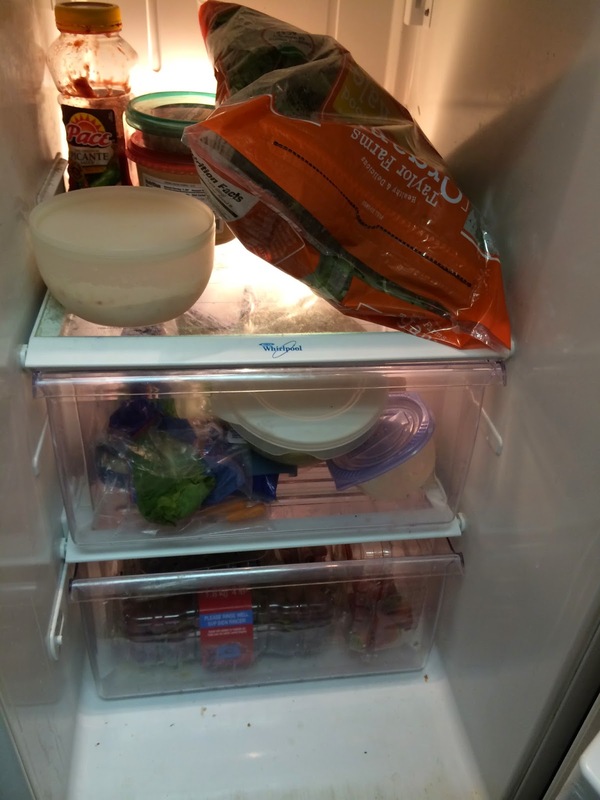 Here’s a look into our fridge…maybe another day we’ll look in my freezer and pantry. 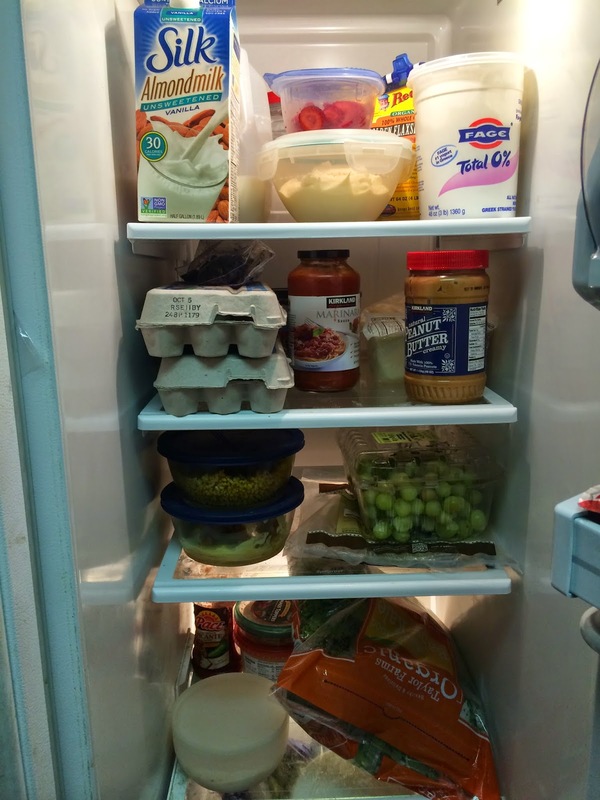 Pictured: Cage free eggs, almond milk, whole milk, plain yogurt, grapes, leftover indian food(sauce made from scratch and I use brown rice), spaghetti sauce (with only a couple of ingredients and no added sugar), spinach, salsa, ground flax, sliced strawberries and homemade, agave sweetened whipped cream, mozarella and cheddar cheese, hummus, variety of fruits and veggies and greens in the bottom two drawers. 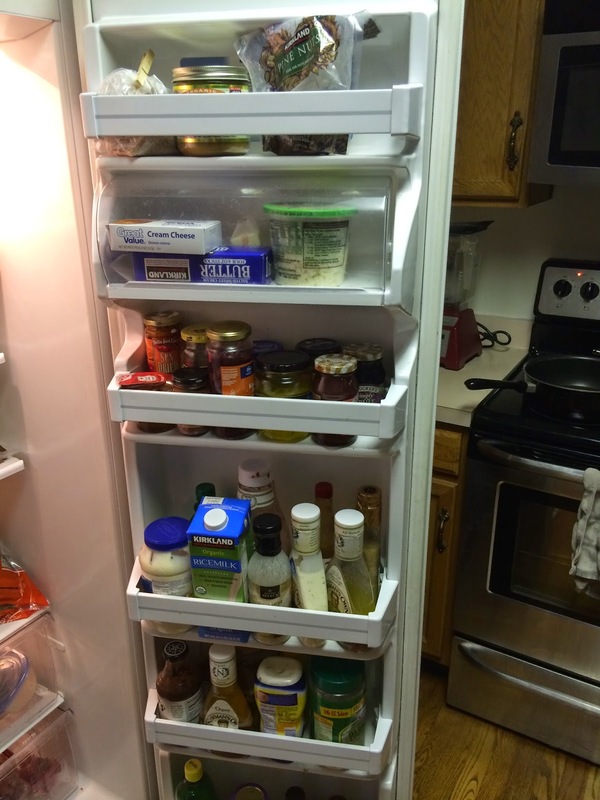 On the door we have: parmesan cheese, homemade and store bought salad dressings(Newmans’ Own makes some good dressings with minimal ingredients, which is always good), butter, cream cheese, all fruit jelly, banana peppers, lemon and lime juice, pine nuts and better than bouillon. I make green smoothies for breakfast every morning, and that’s my breakfast. I drink about 24 oz. The family will each have a small glass, and then different family members prefer different things: homemade granola with milk, oatmeal, whole wheat toast with butter or peanut butter, and about once a week we’ll cook scrambled eggs(no hormones, cage free). Sundays we have a bigger breakfast with whole wheat waffles, pancakes, French Toast, German pancakes or the like. Lunch varies, sometimes the kids take PB and J on whole wheat bread, or sometimes they’ll take leftovers from dinner. Some favorite leftovers for lunches are black beans, oatmeal, pasta, or soup, all of which are great in a thermos, or pizza, waffles, quesadillas, granola with yogurt etc. With their sandwich or leftovers they’ll take some fruit, usually grapes, oranges or apple slices, and some carrots or celery. Scott and I have a lot of the same thing for lunch. 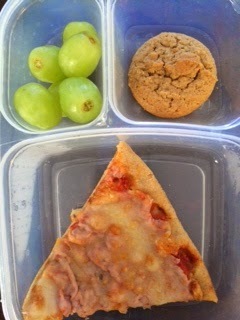 Below is leftover pizza with grapes and a whole wheat, honey sweetened peanut butter cookie. 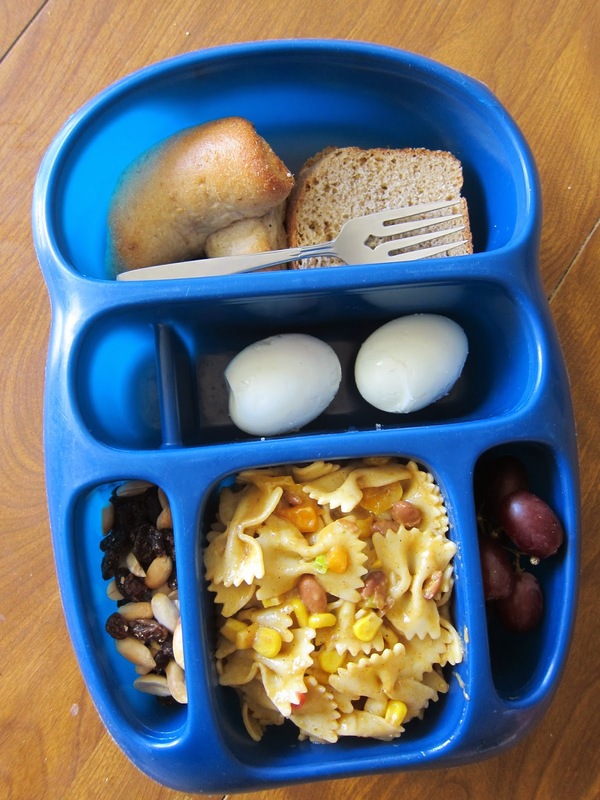 This was a lunch I packed for my 2 young girls and I when we went on a picnic: hard boiled eggs, pasta salad, homemade trail mix, half a pb and j sandwich, leftover whole wheat dinner roll, and grapes. For dinner we make a variety of things. Homemade pizza is a Friday night tradition. We usually have Mexican and another Italian dish some time during the week, and many times we’ll have a soup or chili, and some sort of Asian/ Indian dish. Pretty much everything is made from scratch, minus the pasta noodles…I’ve done those from scratch a few times and probably will do it more in the future when life is a little less busy, but for now, the stores make pretty inexpensive whole wheat pasta noodles. I make a large crock pot full of black beans each week, and we usually make a batch of brown rice each week which we use for Indian/Asian and Mexican dinners. I also cook quinoa fairly regularly and keep it on-hand in the fridge to throw into salads or to mix with brown rice etc. I like to keep a lot of produce on hand, and a good variety, because they will snack on it more when it’s there and out in plain sight. When they come home from school I always pull out produce like grapes and carrots, apple slices and other fun fruits we have like blueberries and strawberries. Before we put the dinner entree on the table, we bring the salad out and dish that up for everyone. They are much more likely to eat it, and a good amount, when they’re feeling really hungry, right before dinner, and it’s the only thing out on the table right in front of them. Once most of them have finished their salad, we bring out the main dish. Dessert, most days, is fruit after dinner. Once or twice a week we’ll have something with sugar in it or something that qualifies more as a dessert even though there is no refined sugar, like our honey-sweetened peanut butter cookies, or maple syrup sweetened home-made ice cream. Scott likes to keep dark chocolate bars on hand and once or twice a week, him and the kids will each have a square. I wish I had that kind of will power :). I don’t eat chocolate, I haven’t for years, but I do enjoy treats and I have a weak spot for strawberry Aussie licorice. Because I’m aware of my weakness, I buy them from the bulk section at Sprouts, and I only buy five at a time, usually on Friday for my weekend date-night treat :). I don’t buy them every Friday, but if I know we’re not going to make something else that weekend, than it gives me something to look forward too. Eating whole foods and being active is part of who we are now. We enjoy the food we eat. Fresh tastes SO much better than processed, but you’ve got to get rid of the processed that’s loaded with sugars and salts and all sorts of preservatives and additives, before you can really taste and appreciate the fresh, because it changes the flavor. We enjoy being active together, playing sports, going for walks and hikes. We want to take care of the bodies our Heavenly Father has given us, that house our spirits. We are grateful for good health, we work for it, and we look forward to living long, healthy and happy lives.